It was a long, noisy, good-natured parade of protest that wound its way through London yesterday. The unions had handed out sort of vuvuzelas (remember the football World Cup?). The noise was pretty awful, but much better than the Socialist Workers trying to rally the crowd with the same slogan they’ve been using for the whole of my life (What do we want? A general strike! etc.). And there were a lot of people. I got to Trafalgar Square at about noon, and the head of the parade arrived soon afterwards. We finally joined in about 12:45, and there was no sign of it abating. When we finally got to Hyde Park (about 1:30 or so), apparently there were still thousands of people back on the Embankment who hadn’t even started to move. 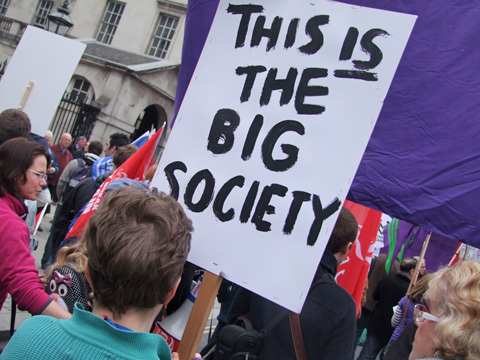 As many of the speakers pointed out, the Big Society was here in force: a huge number of people saying ‘no’ to the present government’s decimation of public services. A note on decimation: it was originally the Roman punishment for a unit which failed in battle: 10% of the troops were selected for execution. Compare: “the 25 most disadvantaged councils according to the 2007 Index of Multiple Deprivation will see their budgets reduced by an average of 9.4 per cent in 2011/12”, while “the 25 least disadvantaged councils will have their budgets reduced by an average of 4.6 per cent”. No, our march won’t stop the government from doing what they’ve planned. In a precise functional sense it was useless. But still more useless not to make your protest. We were marching for an alternative which won’t immediately happen, in political terms, but which needs to be made visible against the language of ‘there is no alternative’. Margaret Thatcher used to say that, I recall. She was wrong then, and David Cameron is wrong now. There are always alternatives, and the art of politics is in choosing them. Each has its dangers as well as its opportunities. The decision to cut now, and cut deeply, was a choice not an inevitability. And 250,000 people were there to say it was a bad choice. UK government policy is demonstrating in practice exactly the same ideological commitment to the ‘small state’ that neo-liberals have held since the 1970s. Oh, was it those neo-liberals who also thought the market should be free to play with numbers however it felt fit? My goodness, so it was – and those numbers turned out to be minuses on all our bank accounts. So if the ‘march for the alternative’ reminds us all for a little while that things could be different, maybe it prepares the ground for things to actually become different. That’s what I’m hoping. You’re right of course. We did have a choice. We could have gone on spending money as if it was going out of fashion, and quickly become like Greece, Ireland and Portugal, with cuts enforced on us that would make the present ones seem like nothing, probably ending up by defaulting on our debts. What’s Christian about that? Where is the biblical imperative that gives us the right to live at other people’s expense? The most chilling statistic to emerge last week was that, even after these cuts, which persuaded you and so many others to march in protest, the government still proposes to spend £121 billion more next year than it will recover in taxes. That is outrageous and completely unsustainable. I am no less appalled by the cuts than you are, but I am appalled that they are necessary, and I blame the people who made them necessary, not those who are trying to get us out of the mess we are in. And it wasn’t the bankers – for all the reckless behaviour and egregious overpayment, which I deplore too, they were a mere sideshow in the overall picture, the trigger of the crisis but not the cause. You probably think I’m a Tory toff from a privileged background, but I grew up in a working-class family in a rented terraced house. I was able to go to a direct-grant school in the fifties and then to one of our great universities, when a far greater proportion of working-class people went there than is the case today. I wish such opportunities were available today but they are not, and it wasn’t me who pulled up the ladder. And, by the way, I am an affirming catholic -I just don’t think that leads to the same political conclusions as you do.